Hello how are you? I have been a busy bee recently there's lots of crafting going on but I just can't share any of it at the moment, however I have a video for you today. I recently took on a new job and that is to provide some videos for the fabulous forum I love to spend my spare time on, ILWS ( short for In love with stamping) is a lovely place to hang out and make new crafty friends and like I said I spend an awful lot of time on there as we have a demonstrators only hidden part, and I always felt guilty for not supporting them a bit more. So this is my way of saying thank you to those that run the forum. Come on by and say hello I would love to see you there (check the ILWS link on my top menu bar). Here is the cute project I made. This has got to be the world easiest treat holder and you're probably done this since kindergarten , but there are a few neat tricks I am sharing on here so I hope you will watch the video ignore my bad editing( I have gone a bit rusty), and my terrible nails (I have an appointment on Friday and I cannot wait) and ENJOY !!!. Great video Monica, you are right that these have been on the go for a while but I love the extra touches with the tag and the word window label. Like the video! You always show me something new, Monica. I will have a go at those treat boxes and post it on my blog. GENIUS!!!!!!! LOVED the tip about the ribbon,twisting it,then putting the brad over it...BLEW ME AWAY!! !Love your website. You inspire me ALWAYS!!!! Love the little ribbon accent. Thanks for sharing your creative talents. This is fab - absolutely love it! Perfect! Excellent video Monica! Just love those pretty finishing touches - especially the ribbon bow. Totally adorable. Thanks for all the neat tips and tricks! Got to go make one before I forget the folds, bow and closure!! wow that is amazing and so pretty. I have made those pouches once before but never seen it decorated so wonderfully and the bag closure is brilliant. Thank you. I'll have a go at this one day. Definitely so cute.Normally pink is not my cup of tea,but there ,i love it so much. 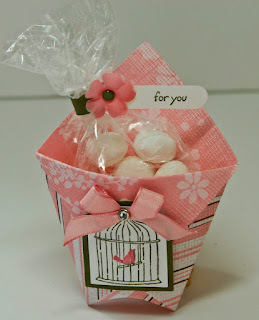 I just hopped over to your blog and saw this cute treat holder and had to do it myself right away. Thank you very much for this loveley idea and video to show. I found a link to this video on Paper Friendly. Great video! I have seen these treat holders, but learned lots of neat tricks from you that I hadn't seen before (like pushing in the bottom). Love how you made the bow with the brad. I have the word window on order, and now I can't wait for it to come. Thank for sharing ... all the way across the pond in the US!